The first Intro to Electronics Workshop of 2012! 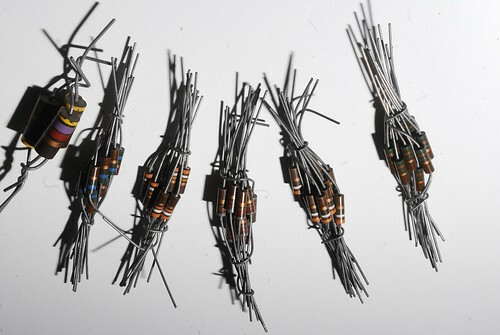 Besides being fun an colorful, resistors are a very useful electronics component found pretty much in every electrically powered device we use. Want to learn how they work? Been itching to trick-out your old phone/toaster oven/lighting fixture?Interested in building your own electronics devices? Come to the Intro to Electronics Workshop on Tuesday, January 31 at 7 PM. You’ll get to learn about voltage and current, diodes, resistors, capacitors, and more. Through building a variety of circuits, you’ll learn how the basic elements of electronics work and interact with each other. You’ll walk away with some very useful knowledge and a box full of components for you to start your own projects. No previous knowledge or experience necessary. Call Metrix Create: Space to reserve your spot in the workshop or come by to sign up. $50 gets you two and a half hours of instruction and all the materials for the workshop.